Christopher Rehage decided to take a photo of himself each day when he started his walk in the fall of 2007. His plan was to walk from Beijing, China to his home in Germany- a distance of five thousand miles. He didn’t make it to go that far, but managed to walk for nearly 3000 miles and grow an impressive beard. He started his journey on his 26th birthday, November 9, 2007, with a freshly shaved chin and head. By November 13, 2008, his hair and beard had grown to scraggly lengths before he cut it again. His photos have him solemn faced and happy at times. He either has a straight face, or is pulling a silly funny face. He is pictured in the snow, in the sun, on the street, on a plane, in a black waterproof coat and all the while, his beard and hair keep growing longer. When he decided to stop his journey, he shaved off his beard and hair. Rehage says that walking connects him to all the places he visits and that’s why he loves it. In the end, he walked a total of 2,796 miles -which amounts to 7.5 miles a day. 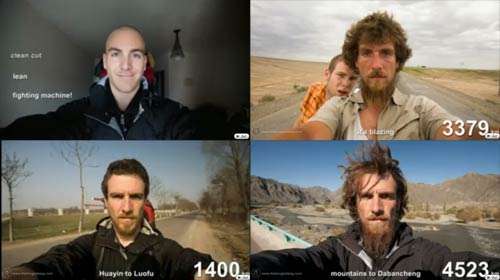 From Beijing, he stopped at ürümqi and after an year of blazing hot deserts, Rehage realized he had grown a very long beard. He claimed that during the walk, his state of mind was like that of any other day. Rehage didn’t make it to his home in Bad Nenndorf, an issue that poses a lot of questions on his website. People want to know why he stopped short of his plan. Maybe he just got worn out after walking 3000 miles and his feet hurt. Who wouldn’t? Previous article Some Of The Most Unique Airports In The World.